This year Loughborough University celebrates its 50th birthday. On 19 April 1966 the Queen signed and sealed the royal charter of incorporation that granted university status to Loughborough College of Technology. The new Loughborough University of Technology was the first of the ten Colleges of Advanced Technology to become a university and thus the first technological university in England and Wales. In its first full academic year, 1966-67, the new university had 1742 undergraduates (of whom only 56 were women) and 141 postgraduates. In the academic year 2014/2015, the university had over 16,000 students in all. Royal Charters or Letters Patent were sealed by appending the Great Seal of England, which has been used since the reign of Edward the Confessor in the eleventh century to authenticate documents of the highest importance. The seals were originally made of beeswax. On one side of the seal (called the obverse) the monarch was shown enthroned and on the other (called the reverse) depicted on horseback. A new Great Seal is made on the ascension of each new monarch. Modern seals are now made from heated thermoplastic which is poured into a solid silver mould and pneumatically pressed to obtain the imprint of the matrix design. 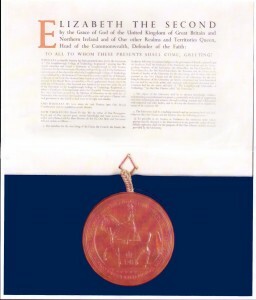 The Great Seal of Queen Elizabeth II attached to the University Charter was designed in 1953. Here is shown the reverse side with the Queen on horseback wearing the uniform of Colonel in Chief of the Grenadier Guards. On the obverse she is shown enthroned, holding the sceptre and the orb. This Great Seal of England was replaced in 2001 and documents issued since under the Great Seal now show the older Queen on the obverse, while on the reverse the image of the Queen on horseback has been replaced by the full royal coat of arms.